-24 % Redness diminution in 8 weeks (Clinical test, 42 women, sensitive skin). 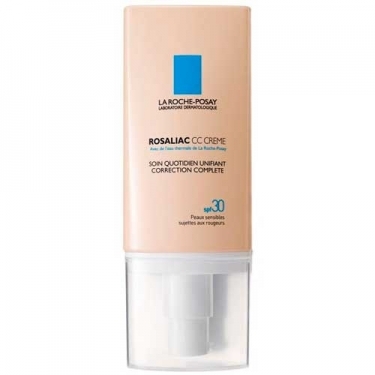 Rosaliac CC Cream is a La Roche Posay unifying corretiion cream to reduce the intensity of redness, whether occasional or persistent, dispersed or located. This formula was developed with a universal tone that creates instant coverage and targets skin-color flaws. It moisturizes, soothes and corrects all types of redness. Enriched with natural Ambophenol extract, which helps to neutralize the redness. Protects the skin with SPF30. Apply daily to the whole face.